Design is a world with very few dull moments. (Unless of course you're cutting out trees in Photoshop.) Designers are problem solvers, and the problems to be solved can range widely - from choosing just the right shade of lavender to writing a slogan that will, finally and definitively, end world hunger. "Design is like spelling. It mattress more than you think." The first few moments embarking on a new project are euphoric...and it's pretty much a downward slope from there. Creativity is a muscle, not a muse. And if you want to build muscle, you're gonna have to sweat. Stolen from Austin Kleon, who stole it from Maureen McHugh. Often times clients hire designers because they believe that we can solve their problems, when in reality they are the ones who know the answers. Our role involves illuminating the pathway to the right solution. You've probably heard this one. 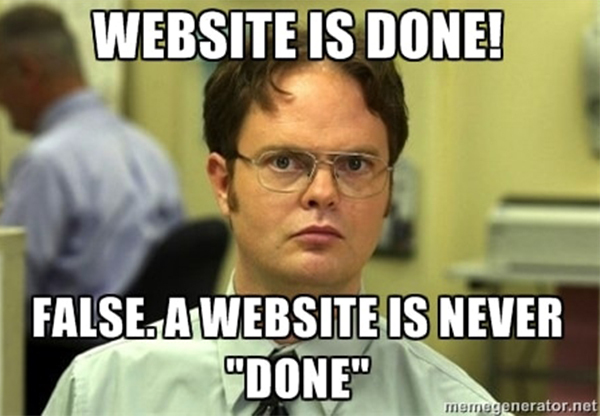 This statement is true insofar as any company with a website should be ever-evolving, thus creating a constant need to update content online. This philosophy may not be applied, however, to deadlines and payments. In that case, it's done when its done. We mainly chose this because The Office is, like, the greatest.